Once the boxes are packed and the truck is loaded, you’re ready to move! 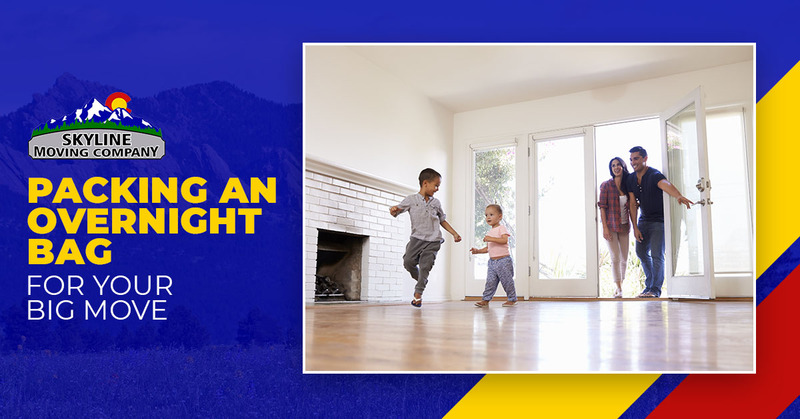 Even though you might feel as though your first day in the new house is going to be a great one because the tough part is now over, you must realize that you’re not going to immediately find all of the things that you need to make this new house a home. Sure, all of the tiny pieces that you use on a daily basis are in your house, but you’re not going to go through all of your boxes just to find your shampoo, are you? No! The solution? Packing an overnight bag for you and your family. What is an Overnight Bag? An overnight bag is exactly what it sounds like — a bag to get you through the night! This bag should include all of the items that you’ll need the first few nights that you’re in your house. Ultimately, this bag is designed to make your life easier and ensure that you can feel comfortable. So what is it that you should be packing in your overnight bag? The team at Skyline Moving Company is going to cover that in today’s blog. If there are any documents that you’ll need access to, pack those in your overnight bag. A few suggested documents that you could pack are your birth certificates, passports, identification cards, and any paperwork that you’ll need for financing, signing on the house, or the like. Having these readily available is going to make the first few days in your home so much easier. Packing takes some time to get done, but unpacking takes even longer. If you’re going to need medication in the first few days of staying at the house, make sure to pack them into your overnight bag. We suggest packing a couple days worth of your medications because you never know how quickly you’ll be able to get your medications unpacked. It’s always better to be safe than sorry, especially in regards to your medication. As you may have guessed, your overnight bag should have some clothes in it. From the pajamas that you’ll use the first night that you sleep in the house to the clothes for the next day so that you can unpack comfortably, you’ll want to account for everything that you need. By properly labeling the boxes with your clothes in them, you can easily find them through the unloading process and have access to them pretty quickly. A new house is usually move in ready, but not ready enough that you’ll have shampoo or toilet paper during your first nights stay. Unfortunately, these are things that you’re still going to need to get a hold of during those first couple of days at your new home. For that reason we always suggest saving some room for toiletries. By packing enough toiletries to get you through at least a couple of nights, you can ensure your family is able to clean up and relax when the moving is done. Though you may not want to spend the first few nights in your new house cleaning, there’s a good chance that you’re going to need to do at least a little bit of cleaning. While it’s not your immediate overnight bag that we’re talking about here, there should be a box of cleaning supplies that you have readily accessible. Now that you’ve got your overnight bag ready for the first days at your new house, it’s time to get the move started! If you haven’t already, you need to schedule your movers. Professional movers can make a huge difference in how smoothly your move goes. From the packing to the unloading, our team can help you get your move done. Whether it’s from one side of Colorado to the other, or it’s simply to your neighboring town, we’re always here to help. Contact our team today to get a quote on your move and learn more about the services that we offer.